Voice-powered UI systems are everywhere we go today. In fact, speaking systems are so common that we barely notice they are there. But it hasnâ€™t always been that way. No, this isn’t a vintage deli meat slicer or an old bench saw. Meet Tim: Siri has a grandfather. 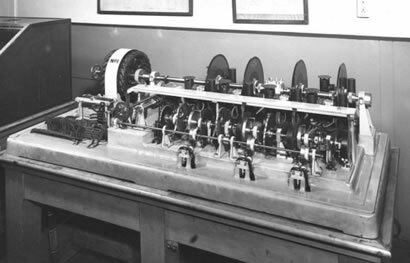 This is TIM, one of the worldsâ€™ first talking clock systems and it was launched in London in 1936. 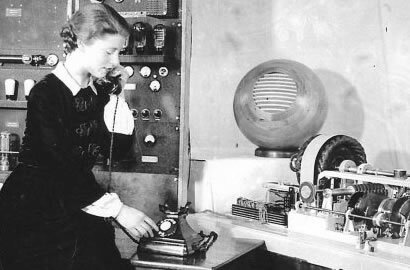 Anyone with access to a telephone could dial the â€˜talking clockâ€™ number and have the precise GMT time read to them – down to the second. 13 million users dialled the talking clock in its first year of operation. Everyone from station masters to bus drivers to bakers to village clock timekeepers set their time via the talking clock. Arguably that makes â€˜TIMâ€™ the worldâ€™s first mass-market, electronic data service. Decades before the internet was even an idea, thousands of people every day were connecting to a fully-automated, networked information service. This was your grandparentâ€™s internet! Of course, this was long before transistors and silicon were available, so TIM was made up of an elaborate clockwork of motors, rotors, disks and dials. The glass disks you see along the spine contain a library of 79 unique time designations â€“ â€˜five pastâ€¦â€™, â€˜six pastâ€¦â€™, â€˜seven pastâ€¦â€™ and so on. Essentially TIM was a complicated, large-scale blending of a record player and a cuckoo clock â€“ but one that could talk to hundreds of users a minute. Voice auditions were held among the Post Officeâ€™s 15,000 operators to select the â€˜voiceâ€™ of the clock. Ethel â€˜Janeâ€™ Cain (above) became the voice of time in the UK from 1936 to 1963. 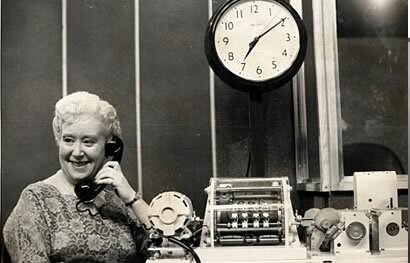 In 1963, the British Post launched a new generation of talking clock called the â€˜Mark IIIâ€™ which was voiced by the elegant tones of Pat Simmons (above). Patâ€™s voice would be heard by up to 400 million people a year until she was replaced by Brian Cobby in April 1985. Though the Mark III was officially decommissioned, it was moved to the British Horological Institute Museum in 1985 where it continued to function perfectly for visitors for 20 years. According to Alan Midleton â€“ museum curator â€“ one day in 2005, the motor of the Mark III developed a troubling whirring sound before finally grinding to a halt. It took technicians at British Horology Institute months to rebuild and restore it to working order. It was only later that they discovered that Pat Simmons â€“ then aged 85 â€“ had passed away at exactly the same time the clock stopped.